Welcome to a kaleidoscopic treat – Noesis #168. First, please find enclosed a small gift in a small brown coin envelope – for members and non-member subscribers – a memorable, wallet-sized, Mega Society card! In this issue we cover a variety of topics – totally prepared in Microsoft WORD this time. We start with a surprise wish to someone we all hold dear. His long-term dedication, spanning over a quarter of a century in the intelligence testing arena, and establishing several Hi-IQ societies, has made his name synonymous with “IQ” throughout the world. The next item is an interesting twist on chessboard design and game strategy, corresponding to a Polish-developed chess-for-three product. Future Mega Society “admissions test” developers should consider leveraging chess-for-three as a tantalizing test problem. Next, we learn a little about Mega Society veteran, W. H. “Bill” Corley. Bill developed the column “DIVERTISSEMENTS” in the 1984 Megarian publications – where he presented challenging verbal and math exercises. We encourage Bill to resume this column for future Noesis journals after he settles into his new home. Next, we read a letter from long-time Mega Society veteran Christopher P. Harding (Australia). Chris expended an exorbitant number of hours to develop six candidate admissions tests. We disperse the six tests throughout the journal (1/2, 3/4, and 5/6). Chris would appreciate constructive criticism on any/all of his six tests. The solutions are intentionally not provided. 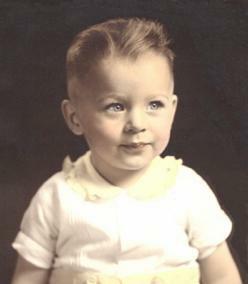 Chris was born in the UK in 1944. He is a co-author of a book I purchased in November 1994 titled “The Ultimate IQ Challenge” with Marcel Feenstra and Philip J. Carter [ISBN 0-7063-7232-8]. What’s interesting is the three authors present an I.S.P.E. (International Society for Philosophical Enquiry) Vocabulary Test in the back of their book that has 70 questions and accompanying percentile score table. An average score on this test is approximately 16/70 correct – the top 45 percent. At the time the book was printed, the top score of 65/70 corresponded to the top 0.0004 percent. Next, we developed a word/definition matching exercise. Here we delve into the intense “word world” of Josefa Heifetz. Jascha Heifetz, Josefa’s father, allowed her hobby of collecting odd words to sidetrack her own musical career as a concert pianist and composer. Working alone, she spent ten years searching through innumerable lexicons and unabridged works too bulky for browsing. She examined and rejected hundreds of thousands, before deciding on the words that appear in her 264-page book. Some of the selected words look like JUMBLES! To keep the intensity elevated, we present the answers elsewhere in this journal. Next, we capture a very interesting study conducted by an insurance research company, Quality Planning Corporation (QPC). QPC presents a table that lists occupations of drivers involved in accidents and speeding violations. You’ll be surprised at the two professions that ironically contribute to the top-five ranked! Next, we return for more mental gymnastics, by presenting 26 famous quotes – the authors of which you are to identify. The answers appear separately in this journal. Next, we present three fun chess exercises with a twist – either for yourself, your children, nephews, nieces, grandchildren, or someone you know appreciates chess. The exercises are dispersed throughout the journal. We do not include the answers. Dr. Miodrag Petkovic is a professor at the University of Nis, Yugoslavia. He has published over 130 scientific papers and the author/co-author of 6 books. The 3 problems are “historical” – but have interesting “twists” to them. Next, we explore a progressive “adjective JUMBLE” exercise – where the first part looks at unveiling JUMBLES, the second places them in interesting sentences, and if this is still too difficult, in the third presentation the JUMBLES are placed in their corresponding sentences to aid your investigation. Here, we team with Dr. Eugene Ehrlich - coeditor of The Oxford English Dictionary and the author of dozens of books. Next, a few words from past Noesis issues. 1. The BALLOTS distributed with Noesis issue #167 should have been addressed to Jeff Ward, our Administrator. I apologize. About a dozen BALLOTs were forwarded to Jeff Ward. A word of thanks to the members. All BALLOTs were received or post-marked 31 March. Nice work! 2. It wasn’t until Paul Maxim wrote a letter inquiring on the missing page 37 (Noesis #167) that I determined that it was really missing. This page is enclosed for you to paste it in the back inside card-stock cover of Noesis issue #167. 3. Regarding the statement by Ron Hoeflin for a call-for-a-vote to reduce the Mega Society admissions cut-off, I inquired with Ron Hoeflin and he was nice to respond back in a letter dated March 23, 2004. As a result of his response (below), we will not be calling for a vote to reduce the Mega Society cut-off. 4. As you can see from Noesis issue #166, and this present Noesis issue, I r-e-a-l-l-y would appreciate enlightening articles from my fellow Mega Society comrades. Rick Rosner, a former editor, will try to do an article in the future. Ideally, my job would be considerably more tractable if each member contributed a couple of articles per year. To prepare the articles, orchestrate the Noesis journal outline, and publish the journal in a professional manner, can be a full-time job. I entreat my comrades to support our global endeavor. The members make up the “fabric” of the Society, and our readers will be thrilled to see the “bouquet” such an intelligent cluster can dynamically create in each forthcoming issue of their “flagship product” – the Noesis journal. 5. In Noesis issue #167, I did an article titled “Another Avenue for Seeking out Prospective Members for the Mega Society.” We’ve made great headway. I prepared a cover letter that was sent to the USAMO/IMO advisory panels with accompanying email/URLs to the Mega Society home page and Titan Test. In speaking with the new CAMC Director, Steve Dunbar, he says getting the Titan Test to the USAMO (United States of America Mathematics Olympiad) and IMO (International Mathematics Olympiad) winners over the past several years is a great idea. Steve said these USAMO/IMO winners have excellent verbal skills as well, and said in regard to the VERBAL portion of the Titan Test, these candidates should do well. Steve had his secretary forward the email to these winners. The CAMC keeps track of these young, stellar, mathematicians for decades! I have inquired with our founder and Titan Test developer, Dr. Ron Hoeflin, to waive the scoring fee for these specific individuals. I mentioned to Ron Hoeflin that this would open the door to some potentially outstanding Mega Society candidates. I further offered a small personal, contribution to Ron Hoeflin for each “USAMO/IMO winner” Titan Test he scores. A short article on the 2001 USAMO/IMO winners is provided in this issue of Noesis. 6. In a telephone “fireside chat” with Internet Officer Kevin Langdon in March, we discussed ideas for future articles in Noesis. One was the AMC (American Mathematics Competitions) presented in Noesis issue #167. I went the extra mile in the AMC article – and looked at it as a mechanism to reach well-qualified Mega Society candidates. A second topic Kevin suggested was for me to read some issues of the Prometheus Society’s journal, Gift of Fire (GoF), edited by Fred Vaughan. My mind churned at the speed of light, and I instantly offered to exchange Noesis for GoF with Fred Vaughan. To make a long story short, Fred responded in a very positive manner, and Brian Schwartz (Treasurer) said he would pay for my subscription to GoF! Fred and I have similar professional backgrounds. 8. The editor continues to communicate with other organizations and publishers for purposes of introducing them to the Mega Society, its impressive history, and to define avenues to “advertise” the Mega Society’s desire to solicit high-likelihood candidates via publication of the Titan Test. Description: Increase your skills and add new levels of enjoyment to your play with the game that’s taking Europe by storm. Dimensions are 19” x 19” x 19” wood-burned board folds and locks. Velveteen-lined compartments keep carved, wooden pieces safe and secure. Complete with rules, in English. King is 2 ½ “. Handcrafted in Poland. both opponents. Rob Fess, Manager of Marketing Communications (Sovietski) provided the photo below. Sorry, the glasses of Scotch don’t come with the game. Each player plays against two other players. The player who checkmates first is the winner. The player who has been checkmated loses and the third player loses as well, no matter whether this player only passively assisted or even consciously helped the checkmating player. Players must concentrate not only on their own attack and defense, but also on preventing either of the two opponents from checking the other. Permission was given by Yaron Givli to use his copyrighted  chessboard notation photo (above). The top left photo is Bill Corley at 18 months of age. Bill is Professor and Graduate Advisor in the IMSE Department and has been a faculty member since 1971. Prior to UTA (University of Texas at Arlington), Bill worked for IBM at Cape Kennedy in the space program, where he developed a computerized pre-launch checkout of the Saturn V rocket, and for McDonnell Douglas in the defense industry, where he wrote computer simulations of anti-aircraft missiles. Dr. Corley holds a B.S. in Electrical Engineering and an M.S. in Information Science (theoretical computer science) from Georgia Tech, a Ph.D. in Systems Engineering from The University of Florida, and a Ph.D. in Mathematics from The University of Texas at Arlington. Bill's research interests involve both theory and applications. His areas of expertise include optimization, multiple criteria decision making, statistics, network analysis, game theory, fuzzy sets, discrete mathematics, stochastic processes, and functional analysis. 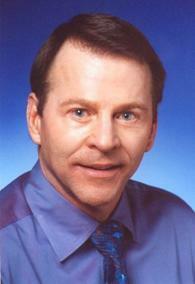 Bill has developed abstract optimization theories for set-valued functions and for functions whose variables are sets. He has defined the notion of multivariate order statistics and established a new type of hybrid fixed-point theorem. He has initiated the study of games with vector payoffs, applied multiple criteria to network analysis, utilized fuzzy sets in decision making, and made major contributions to the theory of fuzzy logic. 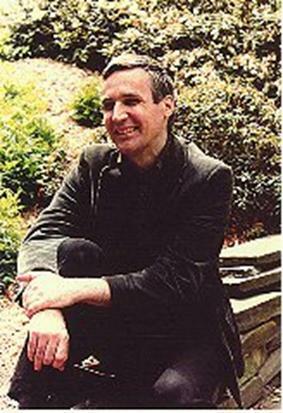 Dr. Corley has been principle investigator on such diverse research grants as designing aircraft wings with mathematical programming, modeling breast cancer using Markov processes, and applying information theory to optimal search techniques, among others, as well as a grant through 2005 to develop a new algorithm for linear programming. The U. S. Department of Defense has utilized his work in network theory. He has published numerous research papers, consulted internationally, runs an annual mathematical puzzle contest for students during Engineering Week, and directed 26 Ph.D. dissertations. Optimal k-Cuts in Graphs: A branch and bound algorithm is developed for partitioning a weighted planar graph into k components containing specified vertices such that the total weight between components is minimized. A Generalization of the Max Flow - Min Cut Theorem: A generalization of the max flow - min cut is proved for a network partitioned into k components instead of two. A Markov Birth-Death Model of Early Breast Cancer: The progression of early breast cancer is modeled as a Markov birth-death process with Gompertzian kinetics. A computer program is then developed for selecting an optimal treatment maximizing expected patient survival time. Capital Budgeting Games: The capital budgeting problem is modeled as a game that is shown to have a nonempty core. Game theory is then used to determine a fair distribution of the yield. A Mathematical Programming Approach to Aircraft Wing Design: A mathematical model of airplane wings is developed with a finite-element analysis. Dynamic programming is then used to maximize the reliability of the wings subject to various constraints. The Wandering Salesman Problem: A network combinatorial optimization problem called The Wandering Salesman Problem (WASP) is formulated. The problem involves selecting a path through a network that has known probabilities of failure associated with the nodes. The objective is to minimize the overall probability of failure subject to a distance constraint. The problem is shown to be NP-Complete and then solved by branch and bound, as well as a "greedy" heuristic. An Axiomatic Approach to a New Family of Game-Theoretic Values: A family of values for n-person cooperative games is developed from a bargaining viewpoint. These values generalize standard values such as the Shapley and Banzhaf values. Generalized Optimization Criteria: The notion of a general optimization criterion is defined axiomatically and some properties established. Some new criteria satisfying the definition are then developed and applications given. (1) IMSE professor Dr. Maria Savant grows plants for a hobby. One evening she goes to eBay and buys some oncidium orchids at $15 each, monkey puzzle tree seeds at $1 each (http://www.victorialodging.com/monkey_puzzle_tree.htm), and iris bulbs at $0.25 each. Dr. Savant buys exactly 100 items (with at least one orchid, one seed, and one bulb) and spends exactly $100. How many bulbs did she buy? (2) Two EE students named Jose and Carlos meet in the lobby of Nedderman Hall to discuss a lab experiment. To determine who writes the report Jose suggests the following game, where the loser does the report. He places 40 pennies on a table. Then each player in turn removes 1, 3, or 5 pennies. The winner is the player who removes the last penny. Carlos agrees to the game, so Jose lets him go first. Select the correct statement from the choices below. Submit only the letter corresponding to your answer. (a) Jose can always win the game regardless of Carlos’ strategy. (b) Carlos can always win the game regardless of Jose’s strategy. (c) Neither player has a strategy that guarantees a win. (d) There is insufficient information to answer (a), (b), or (c). (3) The nation of Griddonesia consists of eighty-one equally-spaced islands represented by intersections of the lines in the grid below. These lines represent horizontal and vertical bridges exactly one-mile long that connect the islands. A Griddonesian environmental engineer named caizb has designed a small flying robot for the continuous monitoring of air-pollution levels on the islands. The Robird® is programmed as follows. After taking a pollution reading on an island, it is equally likely to fly to any other island for the next reading. The process then repeats automatically. If the Robird® starts on the center island, what is the probability that after three flights, it returns to the center island? Express your answer as a reduced fraction. (4) An ME named Jacob pays his UTA tuition by painting houses. The rear of his apartment building A is separated from another apartment building B by an alley of width W. Jacob stores his two longest ladders in the alley by laying them against opposite walls as shown below. Jacob’s ladders intersect 10 feet above the alley. Find the width W of the alley in feet to the nearest three decimal places. switch corresponding to each lightbulb? jackpot amount will Satish receive (after taxes) as the cash value option? stainless steel? Any change in the direction of the knife constitutes an additional cut. are 12 quantum objects in superposition having values both 0 and 1 (i.e., qubits). 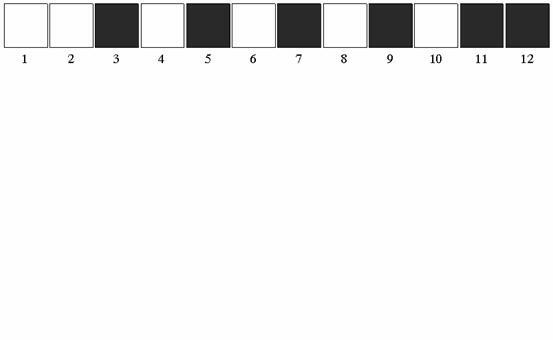 Suppose the 12 qubits are measured, and the superposition randomly collapses to the following cellular automaton. To this cellular automaton, apply the rule: if a square is correlated with an adjacent square, switch colors; otherwise do not. The result is shown below. What square is correlated with square 2? 7 – F, 8 – P, 9 – S. If the English word “is” is numerically encrypted as 2 and “run” as 3 , then what English word used in mathematics does π + 1 encrypt? (13) (Remember, it’s a dirty dozen.) During Christmas break an IE student named Elisa goes on a skiing trip to Keystone, Colorado, which has one snowplow for the road from the town to the ski slopes. It plows at a rate inversely proportional to the depth of the snow on the road. On Elisa’s first morning there, snow starts falling on the clear road at a constant rate. At 9:00 a.m. the snowplow starts plowing the road. It travels one mile in the first hour, then one-half mile in the second hour. At what time did the snow begin? Express your answer to the nearest minute in the form 8:12 a.m., for example. You asked for contributions for the pages of Noesis. The “SIX TESTS FOR THE HIGHER MENTAL LEVELS” on the CD may fill this void? I had a little spare time on my hands. May I suggest that you ask members to write in and offer comments on these six (6) tests and their individual items. I only ask is that the members limit their attack to specific items in the tests rather than aiming their criticisms at me. What would be interesting to know is what everyone thinks of each individual item. This would help in the writing of other items and tests for the future. It is interesting that no one actually asks testees what they think or feel about the validity of items that are used to assess them? The best that I've seen in this regard is a more general approach to how valid people think tests are: naturally the better they do at such things the more they regard them. How could it be otherwise. What would be more informative is what “sense” do they make of individual items. It may be useful if one had a sense of the “face value” individually to the best performing subjects such as those in the MEGA SOCIETY. One can then aim to construct a test that has “appeal” if nothing else. Perhaps with the subject “on side” the validity level of the test can be enhanced. This would sure beat people “fighting” the test author. By Chris. Harding -- Australia. [ 1] Complete the foreign proverb below ?. [ 5] ?= ?= SINK SHIPS. result A=? B=? and C=? AGO BUT WAS THEN ABOUT THE SIZE OF A HARE. WHICH PAIR OF NUMBERS BELOW IS THE SAME AS ANY GROUP OF THREE ? WHICH OF THE FOLLOWING WOULD BE COMMON TO ALL UNIVERSES ? WHICH OF THE FOLLOWING IS THE CONCEPTUALLY MOST DIFFICULT ? GRAVITY is to 2 as MOLECULES is to ?=. 7 or 9 is to 14 or 16 as 22 or 13 is to ? or ? [ 2] Which one below is unlike the other two ?. as TOMMY ATKINS is to BRITISH PRIVATE SOLDIER. Which one below is unlike the other three ?. OTHER 5. WHICH 4 ?. WHAT IS ALSO TERMED `The Devils Rope' ? little else to emphasize'' ? WHICH OF THE FOLLOWING IS DIFFERENT FROM THE OTHERS ?. FILL IN THE MISSING LETTERS BELOW. WITH WHICH OF THE FOLLOWING MEANINGS ? (i) -the end of the week (j) -wisdom. 1. 56. Let x = the number of orchids, y = the number of seeds, and z = the number of bulbs. Then 15x + 1y + 0.25z = 100 and x + y + z + 100, where x, y, and z must be positive integers. Let x = 1 and solve to find that y and z are not both positive integers. Next let x = 2, and solve with the same result. For x = 3, one obtains y = 41, and z = 56. Letting x = 4, 5, or 6, however, again yields that y and z are not both positive integers. 2. (a). Each player takes an odd number of pennies per play. After Carlos plays first, there will be an odd number of pennies left. After Jose plays second there will be an even number of pennies left. The situation repeats. Hence, Carlos can never take the last penny since there will always be an even number. 0 + (1/80)(1 - pn), n = 0, 1, 2, … . Thus p1 = 0, p2 = 1/80, p3 = 79/6400. 4. 26.033. From similar triangles, W = + . Solve this equation in various ways (including MatLib, Mathcad, or Mathematica). 5. 77 × 6 = 4,941,258. 6. 1. Designate the switches as 1, 2, and 3. In the lobby, turn on switch 2 for ten minutes and then turn it off. Immediately turn switch 1 on and go to the lab. The lightbulb turned on is controlled by switch 1. The lightbulb off and warm is controlled by switch 2. The lightbulb off and cold is controlled by switch 3. Dividing by V and rounding to the nearest tenth of a percent give the answer. 10. 1 cut. The diagonal of the 8 ² ´ 10² sheet is less than 14². Place one piece of paper under the stainless steel such that the hole is completely filled with paper. Connect two opposite corners of the 8 ² ´ 10² sheet with a 14² side of a second piece of paper. Then connect the other two opposite corners with a 14² side of the third piece. Mark the intersection either on the stainless steel or the underlying paper, as the case may be. This intersection is the center of the 8 ² ´ 10² sheet. Next do the same with the rectangular hole, marking the center of the hole on the underlying sheet. Draw a line on the stainless steel that connects the two centers. Cutting along this line divides the both the sheet and hole into two equal pieces and gives the desired result. If the two centers coincide, any line drawn through the point would work. 11. Square 5. The given information produces a unique set of correlations. QPC reviewed over one million driver records across the United States. They determined the top five, along with the bottom five, occupations of drivers involved in accidents and speeding violations. The results  are shown in the table below. According to the QPC, “these numbers blow holes in the conventional wisdom about which professions are accident-prone or dangerous drivers.” They say that, “it appears that educated professionals are most likely to be involved in accidents . Interestingly, for those unlucky enough to be involved in an accident, individuals from two professions which are most helpful after such an incident – doctors and lawyers – are the most likely to be on the scene.” The high frequency of involvement of students is attributed to their lack of experience and low aversion to risk. The bottom five occupational involvements are thought to be a consequence that they spend less of their time driving. On the other hand, occupations such as truck drivers, bus drivers, and tai drivers – who spent much of their working hours on the road – were, contrary to one’s expectations, not in the top five of either safety-risk category. (a) language. (b) symbolic. (c) energy. (d) evaluation. (e) logic. SOUTHPAW is to DOLICHOCEPHALIC as TIMOCRACY is to ? [ 1] WHICH IS NOT AN INTERNATIONAL PAPER SIZE ? [ 6] ROYAL ELECTRICAL AND MECHANICAL ENGINEERS is to R.E.M.E. YOURSELF WITH A ?=.....R !. [ 9] WHICH OF THOSE BELOW IS THE ODD MAN OUT ?. FILL IN THE NUMBER BELOW ? to DEFENSIVE AGENTS USED BY PLANTS AGAINST INSECTS. OTHER 6. WHICH 3 ?. as `THE BOTTOM WILL FALL OUT OF YOUR BUCKET' is to ? WHICH OF THE FOLLOWING IS THE CONCEPTUALLY MOST DIFFICULT ?. WITH THE OTHERS AND WHAT IS THE WORD ? WHICH TWO WORDS ARE THE SAME IN MEANING ? clue: there is a single correct answer ! As mentioned in another article, as editor I am persistently on the prowl for enticing, novel subject matter for our “flagship product,” the Mega Society’s Noesis journal. Here, I stumbled on an invaluable resource, “Bartlett’s Roget’s Thesaurus,” ISBN 0-316-10138-9, copyright 1996 by Little, Brown and Company (Inc.). Embedded throughout the book are famous quotes. I selected a small subset of my favorite quotes for you to name (identify) the author. Have fun! Given a list of people and questions showing who has answered which questions correctly, we’d like to rank the people by intelligence using only Bayesian inference. Say we have a given distribution P0(IQ=y) representing our estimate of the probability that a person’s IQ is y, and say we know the probability that a person with an IQ of y will answer a question correctly P(A correct | IQ = y). We want to be able to get a revised estimate P1(IQ=y) after the person answers a question correctly. (If we take y to represent rank within the population of test takers, we can take our a priori estimate of P0(IQ=y) to be a constant function). We'd like to revise our estimate of Po(IQ=y) given that the person answers question A correctly (or, without loss of generality, incorrectly). If we could define IQ=x as capturing every aspect of a persons question answering ability we may be able to assume independence, but we know there exist questions A,B and people x,y such that person x answers question A incorrectly and B correctly while person y answers question A correctly and B incorrectly. For example, examining the answers to the Mega Test, we found clusters of people doing well in the verbal questions and clusters of people doing well on the non-verbal questions. (note that if we assume for all questions A,B and if all our are identical linear functions in y for all questions A, then the medians of each persons IQ distribution will rank the people in the same order that you would get by ranking people by the proportion of questions they correctly answer. which is the table function that is zero except for the region between the mean intelligence of the most intelligent incorrect scorer and the mean intelligence of the least intelligent correct scorer. It is not clear how my idea and Chris Cole’s idea are related. (Although they do give identical answers when the p(x) are disjoint). ~......In my view other laws will operate across the boundaries linking various dimensions some of these beyond space and time. The laws of the Universe would appear to be of two types if we accept this as a starting point. One ”binds'' dimensional structures together and are in my view the ‘true laws'. The others are out-come derivatives operating within set structures whose functional modes derive from the way other things are: they as it were have no choice but to behave the way they do; that is part of their constraint. 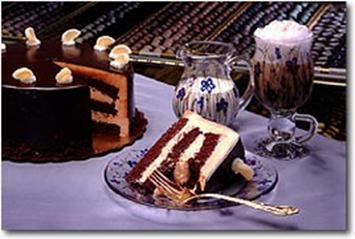 In this they give rise to the fine detail of existence. .......With gravity operating across dimensions, no location within a simple accessible structure will be at all possible. It will however be ‘located' in this sense AS A CONTRADICTION in the translation from one dimension to another where these dimensions possess different expressed properties. The properties of space are different from those of time. Time is for example one directional. The force of gravity reflects this attribute of time when expressed in spatial terms. ONE MAY SAY THEN THAT TRANSLATION ACCROSS DIMENSIONS WILL LEAD TO APPARENT CONCEPTUAL CONTRADICTIONS THE CONTRADICTIONS BEING TERMED LAWS FROM OUR PERSPECTIVE. Physicists say that space and time dissolve into the ‘Quantum foam' on scales below 10 to the minus 60 cm. At this level space and time become mixed up - and quite indistinguishable. It is said no one knows what ‘laws' operate at this level. My mind jumped on a step - the hypothesized `hidden variables' would fit the bill!. This suggesting ~a check sum~ for the universes accounting procedures. as the ~starting addresses~ related to the factor of ~quantum decoherance~. Galaxies. That is, in ‘deep space' this lead me to suggest that variation in light speed might account for the 3K background radiation of the universe. Speed variations would lead to persistence giving rise to “permanent features'' of the universe from our perspective. One could also see in this the need to ~defrag~ the universe like one would do to ones computer files. Could we find evidence of this at work at the ‘sub sub-atomic level'? Is it possible that all the dimensions are the same; i.e., the oddities of time do not stand apart from those properties of space? By this it is supposed that the 4th dimension is seen as an ‘anchor point' in the evaluation of the 3 dimensions of what we ordinarily regard as spatial ones. To the 5th dimension, the 4th dimension appears spatial in its property for then the anchor point has shifted. as one on a continual landscape or as a ‘static' picture. ‘Events' then do not ‘occur' but are ‘transcribed' from the relative vantage points of ‘bundles' of dimensional properties. In order to ‘possess' some `event' it would seem only necessary to engage in a ‘construction' i.e., the making of the structure in order to ‘frame' what one wished to possess? Is then the REAL WORLD a choice in construction of outcomes? The answer is there in our speculations some where; putting it together will however turn out to be the difficulty? PROBLEM 1 – Shinkman’s Zig-Zag Problems. Created by W. Shinkman (1847-1933), a great American composer of chess problems, these three famous zig-zag problems, called replacing games, have to be solved in the minimum number of moves. PROBLEM 2 – Pistol Theme. The so-called “pistol theme” was composed in 1911 by the outstanding English chess thinker T. R. Dowson. Like Shinkman’s problem, the pistol theme was also included in Zalepukin’s encyclopedia of chess problems [Kiev: Zdorov’ya, 1982]. The board has an unusual shape – like a pistol. Like Shinkman’s zig-zag problems, this Dowson problem can be regarded as a replacement puzzle. How can White play and force mate in his 21st move? The abbreviations are BKING (black king), BB (black bishop), WKING (white king), WB (white bishop), WKNIG (white knight), WR (white rook), and WP (white pawn). Adjectives form a powerful complement to our “communication arsenal.” The editor role for the Mega Society’s Noesis journal has my mind constantly engaged in conjuring up new ideas for creative articles. With Noesis as our “flagship” product, it’s exciting to be on the prowl for ways to enhance the variety of topics that we can provide our readers. As such, I browse almost weekly at the local Barnes & Noble bookstore for interesting ideas. Recently, a book by Eugene Ehrlich titled “The Highly Selective Dictionary of Golden Adjectives for the Extraordinarily Literate” caught my eye. When I browsed through the book in the store, many ideas came to mind. I purchased the book and called Eugene at his home for permission to use about 20 of his examples, with a few progressive twists, for an article in Noesis. Eugene was fully compliant and said “Go ahead!” All he requested was a copy of the article. Eugene’s hometown was given in the back inside jacket of the book and using whitepages.com – I found his address and home phone number. Eugene’s address is 1166 Old White Plains Road, Mamaroneck, NY 10543-1052 and his phone number is (914) 698-5397. Eugene was formerly a member of the Department of English and Comparative Literature at Columbia University, is the coeditor of The Oxford English Dictionary and the author of dozens of books, including Veni, Vidi, Vici and the classic bestseller Amo, Amas, Amat and More. In his book, Eugene gives example sentences to illustrate the use of each adjective. I modified about 20 of these examples, by replacing the adjective with a JUMBLE in the sentence for the curious reader to resolve. I apologize in advance if there is more than one adjective that fills the slot for the letters given, but chances are the adjective is unique for the sentences offered and JUMBLE options provided. The exercise is progressive. First I simply list the 20 adjectives in JUMBLE format. Next, I give the 20 sentences with blanks where the adjectives are placed. Thirdly, if this is not enough information, I give the same 20 sentences with the adjective JUMBLE placed in its slot. The answers are given elsewhere in this Noesis issue. In reply to my inquiry with Albert Frank for a short BIO – he sent the following. I was born in 1943 somewhere on the hidden face of the moon. In 1965 I received a Masters degree in mathematics (option: physics, general relativity) at the Liège University (Belgium). I became a chess master and won the 1968 Brussel's chess championship, during my holidays (vacations). From 1966 to 1994, I was teacher in universities in seven different Central Africa countries. I conducted several research projects. I add a short note concerning the main research program. Unfortunately, I could not receive a Ph.D. because at this time in Belgium, to receive a Ph.D. in a field, it was obligatory to have other diplomas in the same field. I was also, among a lot of hobbies, flight instructor, bridge player and puzzles creator. I have been chess champion of 7 countries (the level was low). In 1994, I had to escape from Rwanda, when the horror started there . . . and I lost a lot of masterpiece work I had created. I came back to Belgium. I found a job as statistician in a ministry – but very boring assignment. I retired few months ago. I joined Mensa - it was a big disappointment for me. Then I joined Glia (the 3-s society created in Holland by Paul Cooijmans). And it was nearly the first time in my life I could communicate with, what I refer to, as great people. In March 2000, I took the initiative to invite, in Brussels, several "top IQ people", including Nik Lygeros. It was a fantastic meeting. After that, there where several meetings in Paris (organized by Steve Coy), in Holland and in Brazil. In January 2002, I went to Seattle, WA to visit friends I knew from Africa. And I was invited to visit Fred Vaughan, who is now a big friend – and editor of the Prometheus Society’s journal Gift of Fire. In August 2004, I'll go for the 5th time to Seattle. It is so fantastic to communicate with people like Fred, Bob Seitz, Steve Schussler and others! I have written about 50 articles, and a book which will be published (in French and in English - a great translation made by Fred Vaughan). You will see the announcement for my book in a forthcoming issue of Gift of Fire. The winner will receive – a gift of the Sigma society – the software “Tiger 14”, one of the leading chess player for the moment. 12) Why are there two * in this finite sequence? 1) 6, 4, 26, 9, 60, ? 2) 4, 7, 11, 12, 14, 18, 20, ? 3) We draw points on the circumference of a circle. With pencils of four different colors, connect all the others by straight colored lines. What is the maximum number of points such that no monochromatic triangle appears? 4) From the vertex A of an equilateral triangle A, a laser with thickness zero departs towards the side BC, with angle of 45º measured with the side AB. When it arrives at BC, it is reflected (perfect reflection) towards AC and so on. What's the minimum number of reflections for the laser to hit a vertex of the triangle? Explain why. 5) 8, 65, 4226, 17859077, ? 6) 4, 4913, 1681, 300763, ? 7) 8, 33, 40, 128, 115, ? 8) In a building, there is an hexagonal room with one door on each wall. Each door provides a way to a different room (six rooms in addition to the hexagonal one). Seen from the interior all of the six rooms are absolutely identical in content and dimension. They are empty except for a light bulb on the ceiling. (All bulbs are identical and have only two states (lit or extinguished). The four walls inside each room are smooth and white with a door on one of the walls opening to the central room. The rooms are completely insulated with nothing leaving the room unless the door is opened. (There is no keyhole, no sound escapes, etc..) In front of each door, seen from the central room, is a button (a total of six buttons). There is no interaction between buttons. The hexagonal room is not affected by the action of the buttons; the hexagonal room is not important to the problem. A person must discover the function of each button with regard to its associated room. One does not know beforehand if the light in the room is on or off. (The rooms may be in different states at the beginning). Each button can be actuated only one time and remains blocked thereafter. The person can not actuate the button after having entered a room (that would be too easy). In each room there is a sheet of paper and a pencil; the person must write what is discovered before going out of the room. The doors are marked with a unique number from 1 to 6 and one must start with door 1. A person must approach the first button, press it and enter the room. He then must document the function of that button. He then must leave and approach the second button, press it, enter the second room, and document the function of the second button. He must proceed in this way through the third, the fourth, and the fifth. He must finish with the sixth to complete the task. Given that the explanation for each event will be different and the observations are always correct, what must be the outcome of the sixth button? Note that the man is alone in the building, and that there is no problem with the electrical power supply in the building. 13) 1, 1, 1, 2, 3, 1, 1, ?, 2, 4, 1, ?, 2, 1, 3, 1, 1, 1, ?, 2, 1, 1, 2, 3, 1, ?, 1, 3, 3, 4, 1, ?, 3, 2, 1, 1, 1, 3, 1, ? 14) 2, 4, 7, 10, 7, ? (This is not a numerical series). 15) What does the following encrypted word mean and how is it obtained? 16) 1, 2, 8, 2, 2, 2, 7, 8, 2, ?, ? 17) 52, 72, 11, 23, 31, 31, 15, ?, ? 18) Jacques decides to make an excursion of two days. The first day, he will leave at 7h in the morning to climb a mountain and to arrive on top at 7h in the evening. There is only one path that goes to the mountain. He will sleep on the mountain, and the following day will go down, leaving at 7h in the morning and arriving back home at 7h in the evening. To go as to return, he is not in a hurry, sometimes walks, sometimes races, stop several times to eat, at any hours. What is the probability that he passes, the two days, at a same point precisely at the same hour ? 19) 5, 6, 7, 8, 8, 8, 8, ?, ? Fortunately, Craig was quite bright and worked out which arrow pointed south. Can you figure it out too? PROBLEM 3 – Kriegsspiel Problem. Kriegsspiel (a German word meaning “war game”) is one of the most interesting variants of chess. This game originated in Switzerland in the beginning of the nineteenth century. Later it was adapted for a chessboard by an English journalist M. H. Tample. Today Kriegsspiel requires three chessboards: one for each of the players and one for the referee. 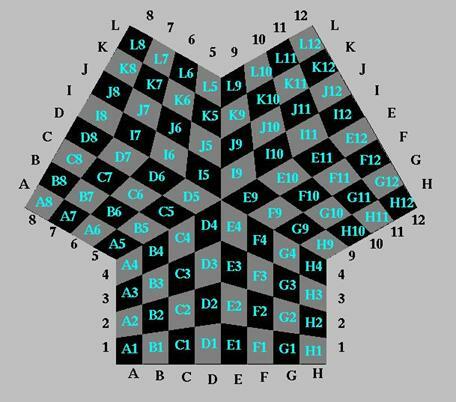 In the beginning of the game, the pieces are placed on their initial squares as in the standard chess game. 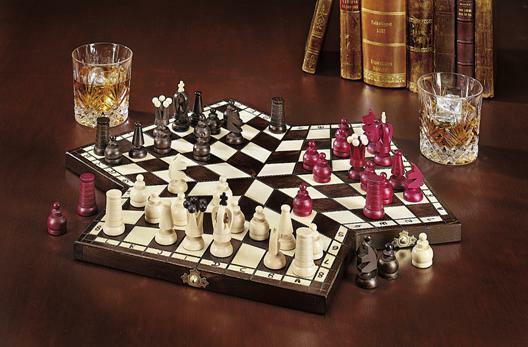 The player’s do not see the opponent’s board, so Kriegsspiel is a kind of invisible chess. The referee keeps track of the positions on both boards, performs the moves of both players, announces whether or not a move is possible (if possible then it must be made), and monitors the correctness of all positions and moves. Also, the referee announces the taking of a chess piece without stating precisely what has been taken. In some variants of Kriegsspiel, the referee can offer additional information, but of a limited character (an attack to a king, taking by “en passant”). The players take turns, each trying to mate his opponent, but the real positions and the complete course of the game can be seen only on the referee’s board. Intuition, tactics, and strategy, often based on attempted (but impossible) moves, especially by the king (which must not move on the attacked square), play a great role in Kriegsspiel. Even very simple positions in ordinary chess become complicated in Kriegsspiel. Here we illustrate a very simple ending. The black king is on the g or h vertical; its exact position is unknown to White. How can White play and force mate as soon as possible without knowing the exact position of the black king? If PART 2 was asking too much, THEN proceed to PART 3. Otherwise, go check your answers elsewhere in this Noesis issue. [ 7] Which one below is unlike the other three ?. the other 5. Which is it ?. WHAT WORD MAY PRECEED AND FOLLOW THE TWO GROUPS ON EITHER SIDE OF IT ? WHICH WORD FROM THE GROUP BELOW IS THE MOST ACCURATE ?. SUM UP IN A SINGLE WORD THE CONCEPT OF `CULTURE' ? his joking reply was ?= ``S e me''. [ 4] Which of the following is ODD MAN OUT ?. (a)2 (b)3 (c)4 (d)5 ARTS. ON THE SECOND LIST BEHIND THE NAMES ON THE FIRST LIST. The following have one century in common. Which ?. FLAG is to POLE as DESIRE is to ?=..ILI..
 HERSCHEL is to 48 as ROSE is to ?=.. THE JUMBLE OF LETTERS BELOW WOULD MAKE SENSE IF UNSCRAMBLED. WHAT ARE THE 4 WORDS ?. WHICH 2 OF THE FOLLOWING ARE DIFFERENT FROM THE OTHERS ?. WHICH IS ODD MAN OUT FROM THE LIST BELOW ? In Noesis issue #167, we presented a background article on the American Mathematics Competitions (AMC) effort I am involved in. I contacted the Director, Steve Dunbar, of the CAMC (Committee on the American Mathematics Competitions) regarding the Mega Society and the CAMC sending the URL for the Mega Society and Titan Test to past USAMO/IMO winners from around 1997 to present. Steve was extremely positive. I sent Dr. Hoeflin the 1997-2001 USAMO/IMO winner’s names and home towns from the book titled “USA and International Mathematical Olympiads 2001,” edited by Titu Andreescu [ISBN 0-88385-809-6], published by the MAA (Mathematical Association of America). An excerpt from this book on the 2001 USAMO/IMO results follows – which you will find highly motivating. The top twelve students on the 2001 USAMO were (in alphabetical order) as tabulated below. Reid Barton was the winner of the Samuel Greitzer-Murray Klamkin award, given to the top scorer(s) on the USAMO. Reid Barton, Gabriel D. Carroll, Tiankai Liu placed first, second, and third, respectively, on the USAMO. They were awarded college scholarships of $15000, $10000, and $5000, respectively, by the Akamai Foundation. The Clay Mathematics Institute (CMI) award, for a solution of outstanding elegance, carrying a $1000 cash prize, was presented to Michael Hamburg for his solution to USAMO Problem 6. The USA team members were chosen according to their combined performance on the 30th annual USAMO and the Team Selection Test that took place June 5-July 3, 2001 at the MOSP held at the Georgetown University. Members of the USA team at the 2001 IMO (Washington, D.C., United States of America) were Reid Barton, Gabriel D. Carroll, Ian Le, Tiankai Liu, Oaz Nir, and Davis Shin. Titu Andreescu (Director of the American Mathematics Competitions in 2001) and Zuming Feng (Phillips Exeter Academy) served as team leader and deputy leader, respectively. Zvezdelina Stankova (Mills College) also accompanied the team, as the observer of the team deputy leader. At the 2001 IMO, gold medals were awarded to the students scoring between 30 and 42 points (there were 4 perfect papers on this very difficult exam), silver medals to students scoring between 19 and 29 points, and bronze medals to students scoring between 11 and 18 points. Barton and Carroll both scored perfect papers. The team’s individual performances were as follows. In terms of total score (out of a maximum of 252), the highest ranking of the 83 participating teams were as follows.